How can i support my favorite contestant ?, Bigg Boss Malayalam Voting online can be done with a single google search. Just open any of the web browsers from your dektop or mobile device. 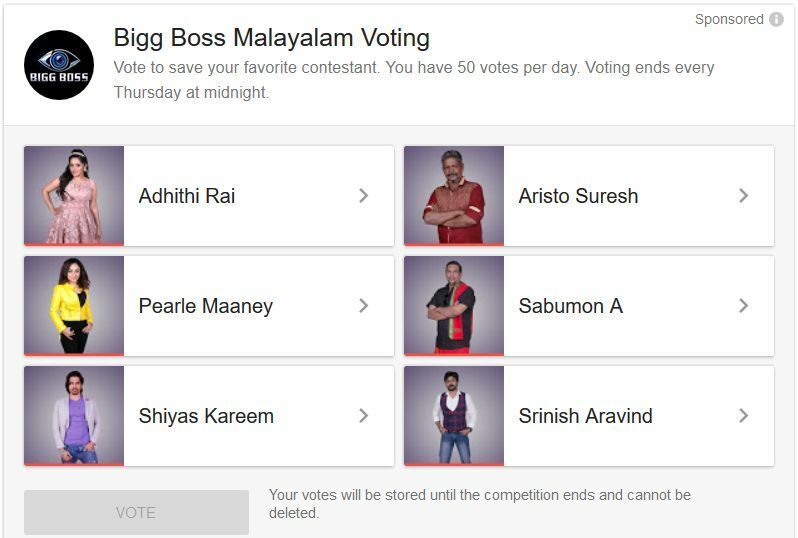 google ” bigg boss malayalam voting ” and you will get a search result like this, please be note that this is the one and only official voting for the show. asianet will not other third part or fan made online voting system for the show. there is multiple options to support your favorite housemate of the show, sms, missed call etc are some other options. Related Story – Season 2 of Bigg Boss Malayalam Coming Soon ? One you get the above page, click on your favorite contestant. for example you need to support Adhithi Rai, click on the image, you will get this page. from here you can submit votes, you can select from 0-50. if you are decided to give full of your daily quata, select 50 and submit. if you have more options, can divide vote into more, example 20 votes to contestant a, 20 to c and remaining 10 to other. There are only 6 people remaining in the house now, they are Adhithi Rai, Aristo Suresh, Pearle Maaney, Sabumon A, Shiyas Kareem, Srinish Aravind. any of these will be the winner of the show. your votes may help them to get more chances to win. Vote to save your favorite contestant by searching it on google, You have 50 votes per day. Voting ends every Thursday at midnight. you will not charge for this online voting, few amount of data is need for the voting system. Update – Aditi Rai eliminated from the show and now only 5 remaining in the battle. Aristo Suresh V Suresh Thampanoor popular for his performance in Action hero biju movie and one of the finalist of the show. he is getting more support from common people. all the best to suresh chettan for the finals. Aditi Rai she is one of the housemate of the show and getting support from all over, Aditi Rai appeared in the malayalam movie Anyarku Praveshanamilla.is there any chances for aditi to win the show ?, wait for few more days for the final results. Pearle Maaney Model, VJ and Actress Pearle Maaney is one of the contestant at malayalam bigg boss show and she reached the final stage. Pearly is getting huge support from fans, she have more chances to win the show. Srinish Aravind Another contestant from serial filed, Srinish Aravind appeared in popular tv shows. Pranayam, Ammuvinte Amma are some of the works from this actor. you can support him in online voting system using the above method. Sabumon Abdu Samad Tharikida show fame sabumon will be a part of the show, sabumon also appeared in some malayalam films.sabumon army have high confidence about the final results, sabu is getting tremendous support all over. Shiyas Kareem He is one of the housemate of the show, model, actor by profession an reached the house through wildcard entrance. You are trying to promote only Asianet ! Is that the purpose of your website? Our latest posts about bigg boss malayalam finale, isl live, ilayaval gayathri serial, odiyan satellite rights, mazhavil multiplex, naagakanyaka season 2, zee keralam chanenl pricing , kairali, we, arabia and amrita movie scheudle etc. is these all related with asianet ?. i think you have just checked few posts only, please browse old posts also. thanks, i have followed some unofficial voting system of bigg boss. i am follower of your site from 2010, un doubtfully this is one of the trusted source for getting channel updates. but now your attitude is very bad. i have read that you stopped updating about trp ratings and satellite rights ?. do you have any valid reason for it ?. this site is not regular now.